The treaty represent Rule of Law with based intelligence from Universal purpose of the Internationally Declared Covenant's of The United Nation's General Assembly, and The Charter of The United Nation's, if the Agreement is not signed and accepted by any entity or person, the person and subject therefore claim own resistance agains't The United Nation's Organization as executive separated body which in own statute of order and mechanism active as event of crime organization which therefore in state position abuse non-conventional purpose of state control and last state internationally diplomacy position's, is recognized the dis-legitimacy of criminal society as a whole, and the society as active resistant agains't The United Nation's Charter therefore lose own right for protection or advocacy and commitment under the Rule of The United Nation's. Is determined important duty of all disputed parties together cooperate in Peace and prevent the conflict increasement, as a duty on The Rule of Law, together prosecute and punish all person's, organization's and societies in opposition agains't the Peace and Legality as The Major Criminal's in World Political Level. The People Association's, association's of victim's or defender's of peace and justice have a right to participate on process of world popular cooperation and medium building, petition's share and with diplomacy advocacy a duty of states decriminalization, also isolate and separate criminal person's from their society with blockade on their touch to the criminal network's, activate application's for Judicial enforcement of crimes agains't victim's, and support their state decriminalization by activating their state jurisdiction right of anti-corruption, forcing a fraud or state self-determination agains't the disputed government with own non-responsible or non-conventional action of executive operation's. Non-Citizen's life in Country of Criminal event, have a right to use a right of legal justice and International rule, if states of terrorist organization don't process the duty for their decriminalization, the criminal states lose legality and their soil is terra nullius, every foreign person no touch in a crime response have a right to declare movement for new sovereignty and start extermination of all member's of terrorist organization. 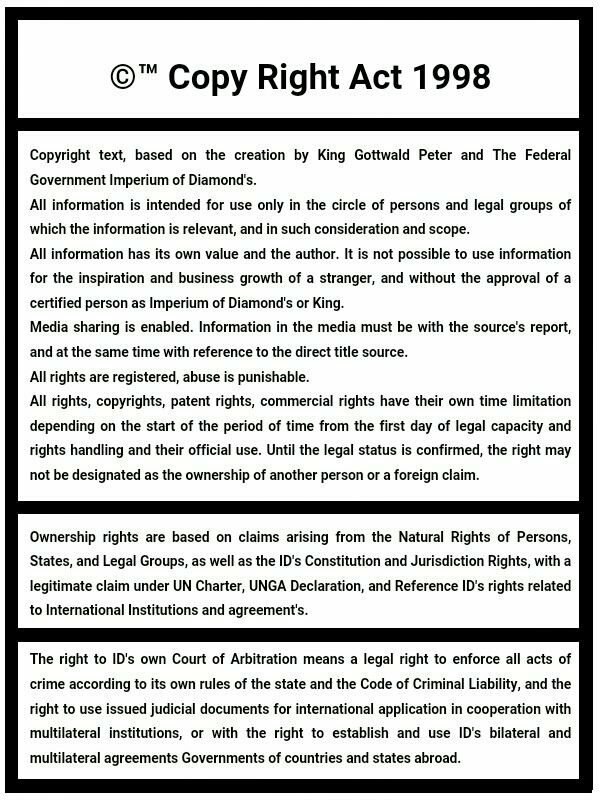 The Agreement is Deposited in Archive of all Parties in Dispute, all foreign observer's have a right applicate for Agreement Deposit and establish the communication Procurature between Disputed Parties, and Validity of Agreement have a validity immediately in time of Agreement Release by the principle as Universally Applicable of Law in event of current situation. The State in Statute of Terrorist Organization have a Right for defense by the UN Rule of Law or Geneva Convention's, and therefore the subject of crime don't can claim or diplomatically attempt to contract the partnership or own interest for War, and all parties of dispute must together cooperate for prevention of all kind's of the war conflict, dispute and claim of interest, the war is prohibited. The Process on disrespect of treaty meaning the act of resistance agains't the rule of The United Nation's Charter and Organization, the Resistant society or subject can haven't validity on the membership in the United Nation's Organization, and therefore the criminal subject which provocate and build the war agains't any UN State or UN Trust State therefore lose the protection by The UN Rule of Law.